I’ve seen Abby, Lorry, Emily and others do this "meme" and thought I’d join in! All you need to do is look into the 4th folder where you keep your pictures stored and post the fourth picture in the file and then explain it. 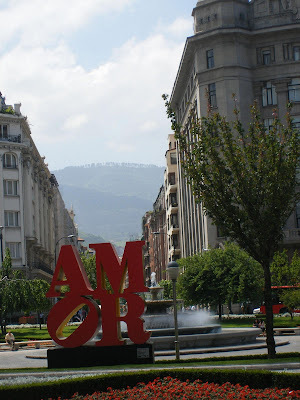 You see Robert Indiana's Love sculpture all over the place now, but I liked that this one was in Spanish. This is from our May 2007 trip to Bilbao, Spain. It was a joint birthday present for us both from NBH's family and one of my favorite trips because we drove from Santander to Bilbao and Bilbao to Pamplona. I love a good road trip and the north of Spain is a beautiful drive. I'd love to go back and stay on one of the many gorgeous cliff side beaches we drove past. Maybe if there is demand I will start back-blogging some of our trips and share pictures. So if you fancy hearing my "old" stories and seeing pictures let me know. I'm glad you joined in... I definitely vote for bringing some of the travel posts & photos to your blog.